Emprint� combines HP color Inkjet printing and Tiger�: the world's most advanced paper embossing technology. Printed documents appear visually-identical to those from HP Inkjet printers. Emprint� also impacts the paper so printed features are raised for touch. 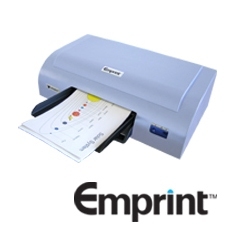 Emprint� literally adds another dimension to your printed documents, using the same paper and ink cartridges as does an HP Inkjet printer. Make your own Haptic Color prints from any Windows 2000/XP file that prints on an HP Inkjet printer.